Fussiness is the inability of an infant to settle down or be soothed. Excessive crying is hours-long periods of crying by a healthy infant whose basic needs are met. Colic is a pattern of weeks-long, excessive periods of crying that is loud, piercing, constant, and occurs in intervals, between which the infant acts normally. Fussiness, excessive crying, and colic occur most commonly between the second week and third month of life. Their cause is usually unknown, but excessive crying is sometimes due to excess air in the digestive tract (for example, from not burping after eating or from swallowing air while crying) or to an infection, such as an ear or urinary tract infection. Rarely, excessive crying is a sign of a serious illness like intestinal obstruction or meningitis. Other causes of crying are gastroesophageal reflux, milk allergy, eruption of a tooth, a hair caught around a finger or toe (hair tourniquet), or a corneal abrasion. Parents of children with excessive crying or colic should consult a doctor if there is nothing they can do to stop the child's crying or if the child has other symptoms, such as fever or poor feeding. Doctors try to diagnose and treat known causes of fussiness and crying. Infections may or may not require antibiotics. Gastroesophageal reflux can be treated by a number of strategies. Air in the digestive tract can be diminished by adequately burping the child. A change of formula may treat symptoms of milk allergy; however, parents should consult with their doctor before changing the formula. Crying from teething usually lessens with time. Mild analgesics and teething rings can be helpful. A hair tourniquet needs to be removed. Corneal abrasions are treated with an antibiotic ointment or drops to prevent infection. If there is no readily identified reason for an infant's persistent crying, the doctor may diagnose excessive crying or colic. There is no specific treatment. If mothers who are breastfeeding notice that certain foods lead to increased crying in their infants, they should avoid eating those foods. Many infants get some relief from being held, rocked, or patted or from the "white noise" and vibration of a fan, washing machine, or car ride. A pacifier or swaddling clothes may also be comforting. Feeding sometimes soothes the child, but parents should avoid overfeeding in an attempt to stop the crying. Some children will cry themselves to sleep. 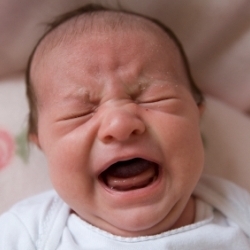 Excessive crying and colic can be exhausting and stressful for parents. Parents should take advantage of nighttime crying interludes to lay the infant on his back in his crib to encourage self-soothing and sleep. Emotional support from friends, family, neighbors, and doctors is key to coping. Parents should ask for whatever help they need (with siblings, errands, or child care) and share their feelings and fears. Overwhelmed parents can take comfort in the fact that despite the extreme distress the crying or colicky infant appears to be in, excessive crying and colic usually disappear by 3 to 4 months of age and cause no long-term harm. For Colic, try the new Zaky! From The Merck Manual of Medical Information – Second Home Edition, edited by Mark H. Beers. Copyright 2003 by Merck & Co., Inc., Whitehouse Station, NJ. 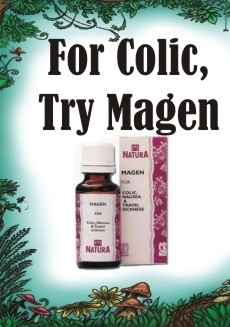 See http://www.merck.com/mmhe/sec23/ch267/ch267b.html?qt=colic&alt=sh for full article. Accessed 5 July 2008. Please visit all of The Merck Manuals free online at www.MerckManuals.com. What is Infantile Colic? | Tips to make your Colic Baby Sleeps | Why visit a chiropractor for colic?